Do you have someone special in your life? If so, are you bored to tears at the thought of giving them flowers or chocolate for Valentine's Day? 1. A bracelet featuring the handwriting of the person your S.O. loves most — could be yours, their grandma's, Dolly Parton's, whoever! All you need is a copy of your beloved's favorite person's handwriting to have this one-of-a-kind accessory made. This bracelet has the potential to be either really sweet or very funny — your choice. Get it from CaitlynMinimalist on Etsy for $27.75+ (available in sizes 5.5–9.6 inches and in three styles). 2. 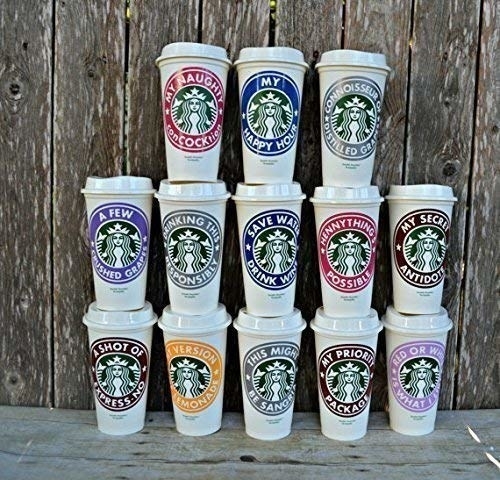 A personalized reusable Starbucks cup any caffeine fiend will adore. If the special someone you're shopping for is constantly sipping on a iced coffee from Starbucks, they will definitely be into this cup. 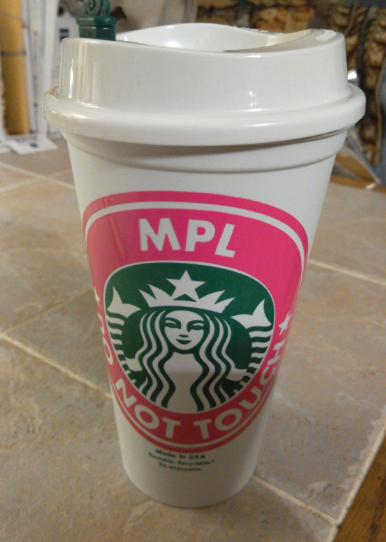 It holds 16 oz (also known as a grande) and can be made in a variety of colors and customized with their name or any other phrase. 3. A birthstone bracelet that can include up to 10 stones, so you can make sure every important person in your S.O. 's life is represented. Whether your loved one has nine siblings and would love if they were each accounted for on their bracelet or you simply pair your stone with theirs, this is a simple piece of jewelry they're sure to enjoy wearing every day. Get it from Silveristic on Etsy for $35+ (available in 10 sizes and 32 styles). 4. A personalized Viewmaster, perfect for anyone who loves a good retro gadget. You can customize the reels with photos that tell your love story! Don't be alarmed if your loved one starts crying tears of joy immediately upon receiving this gift. I remember clicking through my Viewmaster as a kid, looking at colorful images of animals and flowers. However, this version of the classic toy will let you add your very own photos — a truly special gift, if you ask me. Get it from DrZuschuss on Etsy for $21.72+ (available with or without the Viewer itself). 5. A gold bar bracelet you can personalize with something meaningful, like the coordinates of the street they grew up on, your anniversary, or a quote you both love. Do you want to get something extra special for your significant other this year? Then you need to check out this bracelet. You can easily have it customized to include an inscription on the front or the back of the bracelet. You can also choose from a variety of finishes and fonts, making it extra personal. 6. A set of personalized coasters featuring your love's favorite snapshots (or maybe the most embarrassing ones you can find...hehe). Whether your partner is a photographer or simply loves surrounding themselves with pics of friends and family, this is a gift they will appreciate. Designed to look like old-school Polaroid photos, these coasters can be filled with whatever you want! Put your loved one's pet on one, their parents on another, and of course finish it off with a cute selfie of you guys together. Love! 7. A pair of hand-painted sneakers with a sunflower design that your S.O. will love more than a living bouquet — plus they'll last longer than a week! Let's be honest — flowers are beautiful, but they die. Sneakers are forever (or until you wear a hole through the toe). Let your significant other know they are the sunshine of your life by gifting them these kicks. Flowers not their thing? They also have this mystical pair with illustrated crystals on it! Get them from SkinzTime on Etsy for $160 (available in sizes 3-12 and in five colors). 8. 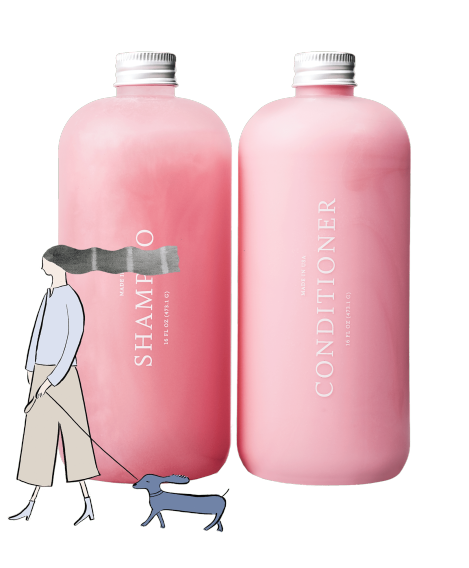 A set of shampoo and conditioner, customized with a formula designed just for your loved one's hair — you can even choose to name the product, pick a fragrance, and select a specific color! Function of Beauty is just that — functional. People have been raving about how much they love these shampoos and conditioners. If you already know what your S.O. would like to change about their hair, you can place the order for them as a surprise. OR you can let them take the "Hair Quiz," so they can customize their beauty routine from start to finish. Such a unique gift! 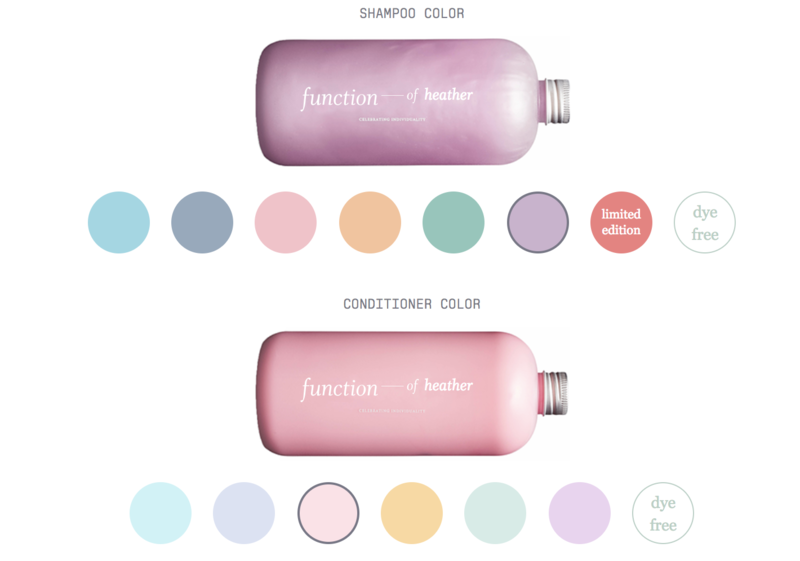 Get a shampoo and conditioner from Function of Beauty for $36+ or order a gift card here. 9. A practical tote with a monogram that can be used for the beach, to carry groceries, or as a diaper bag. The options are endless! Plastic bags are so last year. Help your loved one kick the habit by presenting them with this lovely personalized bag. It has a zippered top, mesh water bottle pockets, and a front section meant for pens. The best part is easily the classy-looking monogram. Get it from Amazon for $30 (available in seven colors). 10. 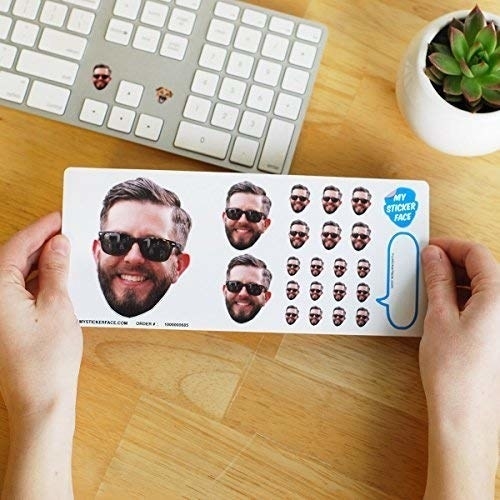 A sheet of custom stickers, so your beloved can decorate their computer, binder, or whatever their heart desires with their pet's face, your face, or a fave celeb. I bought these for my husband for Christmas (with his own face on them) so he could play jokes on his coworkers — they were a hit! Perfect for making your S.O. laugh on Valentine's Day and every other day after that. 11. An engraved whiskey glass that you and your love can clink and say "cheers!" with during your romantic Valentine's Day date at home. Is your partner a whiskey fanatic? Make sure the next sip they have is their most memorable yet by ordering a set of custom whiskey glasses. They'll feel freakin' fancy drinking out of these bad boys. Get it from ExclusivelyYourLLC on Etsy for $9.99+ (available in seven styles). 12. A monogrammed leather tassel keychain, perfect for the partner who is always losing their keys. Make your S.O. 's life easier and get them a cute, custom keychain to hold onto (and easily locate in their endless pit of a bag). 13. An engraved tumbler that will help keep your partner's coffee hot even after they forget about it for an hour after making it. Guilty. This 20 oz stainless steel Yeti tumbler features double walls and can be laser-engraved with your loved one's name. Another added bonus? They'll stop "accidentally" taking your favorite coffee cup to work. Win-win. Get it from ImpressMeGifts on Etsy for $39.99 (available in six colors). 14. A necklace with both of your initials on it, so your loved one can subtly pay tribute to your relationship on a daily basis. This trinket is dainty and the perfect ~little something~ to surprise your valentine with this year. It includes lowercase script letters for both you and your boo's name in addition to a heart. So precious! They're gonna love it. Get it from Amazon for $19.13 (available in three styles). 15. A Disney-style portrait of you and the love of your life, a dream come true for any wannabe Prince or Princess. Are you and your significant other diehard Disney fans? Well then, this is a gift you can both enjoy. You can actually purchase a custom-made portrait of you and your "True Love's Kiss" depicted as if you were part of one of Walt's films. I'm hyperventilating just THINKING about ordering this for myself. Get it from NeeksART on Etsy for $35. 16. Or a custom portrait of you two drawn in the style of The Simpsons ! Lately a bunch of celebs have been posting illustrations of themselves and their significant other drawn as characters from The Simpsons — why not jump on the bandwagon and gift your loved one something similar?! Get it from SimpsToons on Etsy for $48+ (available with up to 10 characters). 17. A basic tee that can be embroidered to make your bae smile — think their pet name, most annoying quirk, or a fun phrase. Madewell offers a whole slew of items that can be personalized! I really like this simple T-shirt with a short saying embroidered above the pocket — not too overpowering. You can also surprise your partner with embroidered jeans or a jean jacket. Get the T-shirt from Madewell for $29.99 (available in sizes XS-XXL and in four colors) and check out the other customizable items here. 18. A personalized pillow with lyrics from ~your song~. No judgment if it's "Perfect" by Ed Sheeran or Cardi B's "Bodak Yellow." Show your significant other you really were listening that day they looked at you while a song was playing on the radio and said "OMG, this is OUR song." Not only can you choose what lyrics you want on the pillow, but you can also include your names and anniversary date. This is sure to gain you a ton of Valentine's Day points. Get it from DoveAndDavid on Etsy for $38+ (available in two sizes and four styles). 19. A sweet picture frame that acknowledges what a good dog dad your significant other is — which is what you love most about him, right? If you and your partner have a pet together, chances are it's the thing you're most bonded over. Show them how much you appreciate it when they go out in 10 degrees to walk your shared pup or how much you love when they play with the dog even after working all day. They're be sure to cherish this personalized frame. My heart is bursting just looking at this intricately crafted cross-stitch! Your significant other's will do the same — because this gift is just so special. The creator encourages you to give as much info as you can to make sure the final product is as detailed as possible. 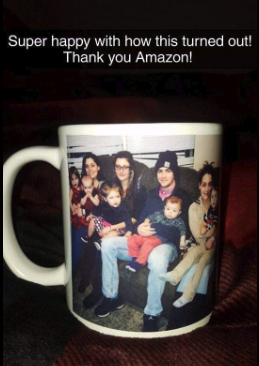 So be ready to provide photos and special clothing requests for this extra-memorable gift. Get it from StitchFellas on Etsy for $115+ (available with up to 12 characters). 21. A monogrammed cuff for the badass in your life who loves nothing more than showing off a trendy accessory. The warm weather will return (eventually), and when it does your valentine will be ready to show off some skin — and this dope bangle bracelet. You can add their initials in a variety of styles for an awesome accent to any outfit. Get it from Mark & Graham for $59. 22. A set of tiny stacking rings that are oh-so cute and a gift any minimalist will love adding into their daily jewelry rotation. These little sterling silver rings are hand stamped with whatever initials you request! 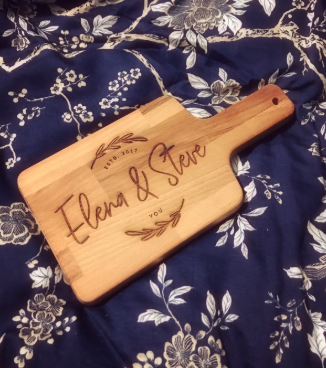 Whether your love is obsessed with Friends and would appreciate every character's name on their fingers (you never know) or they would gush over displaying your kids' names on their hands, this is a super-thoughtful, adorable gift. 23. A keepsake box so sleek and classy it is sure to spark joy, Marie Kondo style, from anyone who receives it. This trinket box can be engraved with a special message or the initials of your loved one. Just think of how fancy it will look sitting on their bedside table — and how clean that table will look without random items strewn all over it. 24. A candle with a customized map that displays the place you met and where ~sparks flew~ for the first time. Aaand it can include both of your names and your anniversary! So precious. The candle is also available in basically any scent you can think of, so you're sure to find one your S.O. will love. Pat yourself on the back after making this purchase, Cupid. Get it from DefineDesignEtc on Etsy for $23+ (available in two sizes and 28 scents). 25. A quilt made of their most-loved T-shirts, so they can cherish them forever without taking up all the space in your shared dresser. This one may be a little tricky to do, as you'd need to round up all of their special tees, so maybe don't make this one a complete surprise? I ordered one of these for myself for my birthday and it is one of my favorite possessions. Just imagine diving into a pile of your worn-in, super-soft T-shirts at the end of every day! Perfection. Get it from Project Repat for $75+ (available in fives sizes and seven colors). 26. A washer bracelet featuring a set of coordinates, essential for any long-distance couple. My husband and I were in a long-distance relationship for four years, and let me tell you, it is NOT very fun. However, small tokens of appreciation always went a long way during that time. This simple bracelet will let your S.O. feel you're close to them every time they glance down at their wrist. Get it from Amazon for $9 (available in four styles). 27. A set of stainless steel straws that can be customized with quirky sayings like "the last straw" and "gin o'clock." Sip, sip, hooray! Is your partner obsessed with integrating more eco-friendly products into their life? Then they are sure to get a kick out of these fun straws. You can personalize them with literally whatever you want, so get creative and have fun ordering these for V-Day. Get them from EverSoPrettyDesigns on Etsy for $6.69 each (available in 16 styles). 28. A custom phone case featuring an illustration of your partner's one true love: their pet! Truly a paw-fect Valentine's Day gift. I don't know about your significant other, but if given the option to have my dog put on ANYTHING, I'm taking it. If their whole life revolves around their pet (and hopefully you) they are sure to freak out over this gift. Get it from NorthLegends on Etsy for $31.13+ (available for 43 different phones and up to six pets). 29. A cozy long-sleeve tee with your boo's monogram on it, so they can snuggle up in style all winter long. It's snuggle season, people! If you're lucky enough to have someone special to cuddle up with this winter, surprise them with the ideal outfit to stay home with. Get it from PaisleySweetBoutique on Etsy for $14.99 (available in sizes S-XL and in 23 colors). 30. A half-moon cross-body bag that can be stamped with your bae's initials for an original and chic detail. My husband surprised me with a personalized Madewell bag for my birthday this year and it is possibly one of my very favorite accessories. The initial touch is subtle, but enough to make people say, "Oh, how cute!" Get it from Madewell for $98 (available in five colors). 31. A delicate initial necklace for the person who prefers simple jewelry they can wear every day. ...or so they can scream-sing the Taylor Swift lyrics, "I want to wear his initial on a chain 'round my neck not because he owns me but 'cause he really knows me." Either way! Fab purchase. Get it from Amazon for $17.99 (available in three styles). 32. An engraved flask, so your loved one can discreetly sip on their fave drink with an added touch of class. This flask looks as smooth as the liquor your boo is likely to put in it. It holds 8 oz and is made of real leather — the personalization is the finishing touch on this classy V-Day gift. Get it from SoGoodSoWood on Etsy for $14.80 (available in 10 colors). 33. 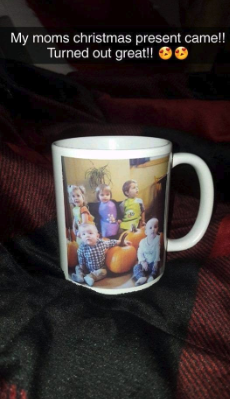 A mug that can be customized with the cutest pics of you and your significant other. Is there anything more cozy than cradling a hot cup of tea in bed on a cold winter night? 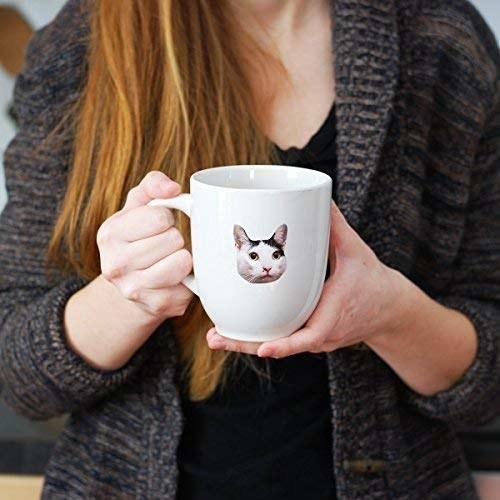 Why yes — all of the above, but with a mug that shows off you and your loved one's best photos! 34. A ring with your fingerprint on it, so your true love can carry a piece of your with them at all times (but not in a creepy You stalker-way). Where was this product when I was choosing a wedding band!? This is so personal and sweet that your significant other will probably melt immediately at the sight of it. This ring is customized inside and out, with your fingerprint on the outside and an engraving of your choice on the inside. Get it from GracePersonalized on Etsy for $55+ (available in three colors and 11 styles). 35. 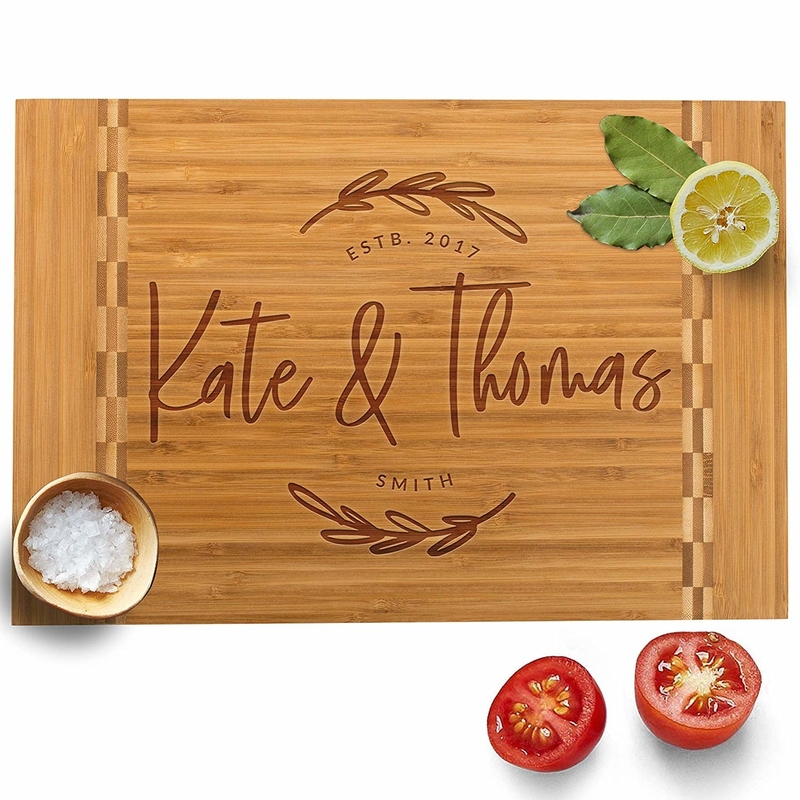 A customized cutting board, perfect for the home chef in your life. Did you and your partner get married this year? Or maybe you've just moved in together? Regardless, if your better half loves to whip up Tasty recipes on the reg, they are sure to appreciate this present. Get it from Amazon for $29.99 (available in eight styles). 36. An embroidered turtleneck to keep your S.O. warm 'n' toasty all winter long. If you want to make an already fabulous item special, look no further than Madewell. They offer a ton of items (think jeans, sweaters, cardigans, and beanies) that can be customized, like this turtleneck. Get the turtleneck from Madewell for $64.50+ (available in sizes XS-XXXL and in two colors) and check out the other customizable items here. 37. An engraved hammer that can be treated as a sexual innuendo (it IS Valentine's Day, after all) or just to remind your S.O. you have a ton of picture frames that still need hanging. Or both. MIGHT AS WELL. If your better half is the handy one in the relationship, they'll get a kick out of this hammer. You can have any quote, saying, name, etc., engraved on this bad boy. Better start thinking of punny ideas! Get it from YoursPersonalized for $12.49+ (available with one or both sides engraved). 38. 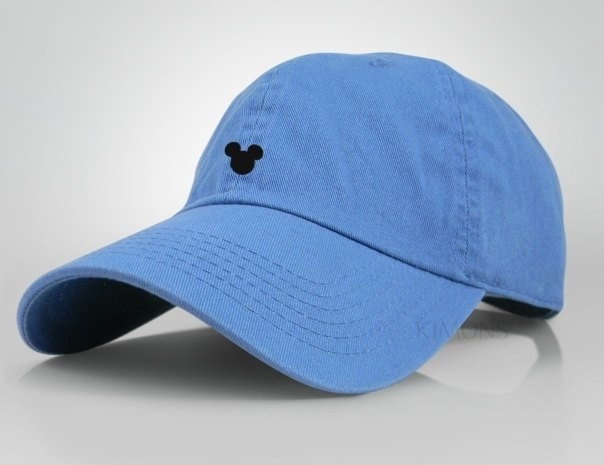 A customizable dad hat, to bring a touch of Disney magic to your partner's style this Valentine's Day. 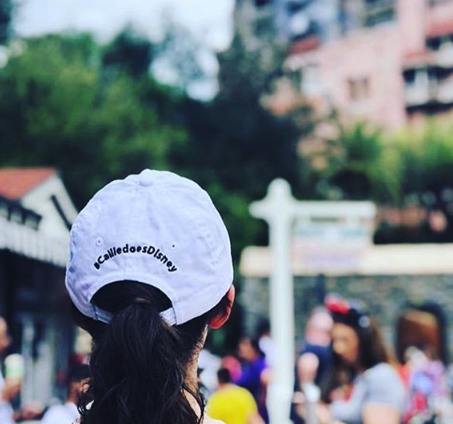 Any Disney fan knows the most important part about tacking a trip to the Parks is ~the fashun.~ Take your Walt-worshipping boo's style to the next level by getting them a customized hat! Not only does the shop have a bunch of styles to choose from (Tink! Mickey! Cinderella Castle!) but they also can add a hand-embroidered message on the back! Get it from 999spyglass on Etsy for $24.99+ (available in 10 colors). 39. An affordable nameplate necklace, a cute gift for anyone in a new relationship. If you're not at a place in your relationship where you feel comfortable being overtly affectionate with a gift, then this necklace is a great option! It shows that you care enough to buy something pretty for Valentine's Day without going uncomfortably overboard. Get it from Amazon for $17.99 (available in four styles). 40. And a set of monogramed luggage, so your S.O. can look bougie AF the next time you guys go on a couple's getaway. Because who doesn't want that? They'll be shrieking with excitement at the sight of this fancy suitcase set. All that's missing from this gift is a private jet and two tickets to paradise. YOU'RE WELCOME. Get two bags from Mark & Graham for $469 (plus $9.50 for each monogram, available in seven colors).